Walter Glass Contemporary Coffee Table. Modern & Chic. Guaranteed to add visual interest to any living room! This double shelved, low lying coffee table is cleverly executed to allow your items to be Guaranteed to add visual interest to any living room! This double shelved, low lying coffee table is cleverly executed to allow your items to be placed on top and below the surfaces. Its modern stainless steel frame makes as a study place to store your living room or office room belongings. The space between the two structures keep your area from appearing cluttered. 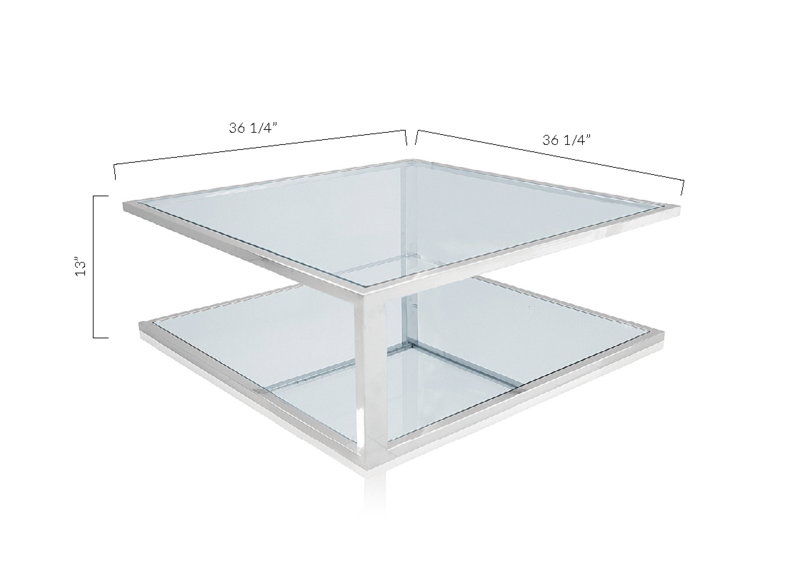 The tempered clear glass surface enhances the surrounding atmosphere, making your room appear more spacious. The Walter Glass Modern Coffee Table functions in a living room, or even to help create a waiting area for guests. Pair with our New Tuco Contemporary Floor Lamp White to enhance your spacious home with its contrasting high-low qualities. Guaranteed to add visual interest to any living room! This double shelved, low lying coffee table Guaranteed to add visual interest to any living room! This double shelved, low lying coffee table is cleverly executed to allow your items to be placed on top and below the surfaces. L: 36 1/4" * W: 36 1/4" * H: 13"